This soap combines the wonderful scent of Coconut with the intoxicating scent of Vanilla to create a very popular soap, especially loved during the summertime months. All of our “Fragrance” soaps are 99.6%-99.9% natural. They contain phthalate free fragrances and some contain essential oils. We use extra virgin organic olive oil (EVOOO) as the base oil, along with the extra virgin organic oils of coconut and sustainable palm. We use rosemary oil extract (ROE) as a plant based natural preservative. We make all of our soaps using the cold process method of manufacturing. This insures that the soap creates its own natural glycerin and the essential oils effectiveness is retained (by far the best soap making method). All of our soaps are completely safe to also be used on the face. Many people also use it to wash their hair, and many men use our soaps to shave. The soaps are hand-wrapped in recycled paper with a round label attached. 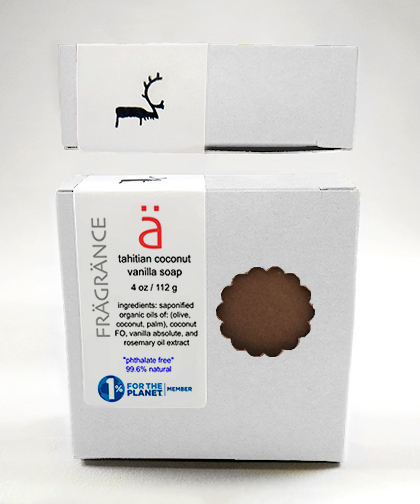 We add a phthalate-free fragrance oil used to impart a coconut fragrance.